Chloe cannot escape the chains of her hometown and responsibilities she thought she was done with after graduation. Defeated, she resigns herself to a life with no future. Then she meets Ethan, a boy who's just moved in and it seems like her life has picked up. That is until Ethan's brother, Oliver, makes his appearance. Later, Chloe reflects on how her life spirals out of control as the three enter an abandoned estate and only Chloe leaves, dragging along one of the brothers while the other burns to death. No matter how much I've talked myself into liking this, I don't think it has lived up to the excitement of Dangerous Girls - which was down right amazing. Dangerous Boys had all the right elements for a great thriller, but somehow it turned out bland and predictable. I kept wanting to reach the end just to clear the mystery for the sake of finishing the book, not because I was interested in it anymore. It really dragged on for me close to the middle, but the ending did pick up its pace so I wasn't left completely bored. I don't particularly like Chloe despite how real she is. Props to Haas for creating a character that is quite relatable, even if I don't condone her actions. She seemed so real because of all her flaws. On the surface Chloe represented the well brought up daughter and straight A student. We sympathise with her for being tied down and having to prioritise responsibilities before herself. Yet, once the story grew I really started to question her character. Was it because of the brothers that influenced her to change or had she already had this in herself, just waiting for the right moment to break free?Questioning my judgement on characters was actually something I really enjoyed while reading this, because at least I was getting somewhat engaged in the story. I don't entirely believe that the brothers - Ethan and Oliver - were realistic characters. It really felt like they were being portrayed as the angel and devil inside Chloe; one being extremely good and the other a total bad boy. I could understand how Chloe may have felt suffocated under Ethan and drawn towards Oliver and his dangerous ways, but it was too predictable right from the start. In the end I just felt really detached reading about them. I wasn't completely disappointed with how the mystery unravelled; Haas did give me a surprise at the end, which made up for most things. Yet, it still felt like something was missing - like there wasn't enough fed to me and I was left wondering what was going to happen after. I haven't really come up to a solid conclusion about Chloe only because she still puzzles me, but at least I understand the motives behind the event and the darker side of human nature. There were big questions about morality and self-desires, and how selfish a person can be. 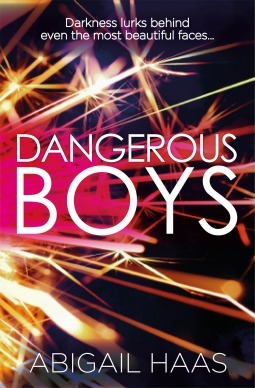 I do think Dangerous Boys was a good read, and I did finish it quickly. Just don't go into it expecting a lot - like I did - and you might enjoy it better than me.